White obi (perhaps much the same as the original album's obi). The obi is wrapped around the middle of what appears to be a simple but thick triple gatefold cover. The back of the obi shows the complete Santana discography at the time Lotus was originally released (1974). 1. Intially you fold open the cover to the left revealling a double spread of the concert auditorium taken with a slightly fish eye lens from well above and behind the stage. The band can be seen on the right of the photo. A single spotlight crosses the auditorium picking out one member of the band. On the right panel of the spread we find a lotus / buddha symbol superimposed on top of the photo - the same symbol as that found on the discs. 2. Opening the left hand panel again we see the track list and credits for "record one" (or disc one in this case) on a gold background. In the centre of the page is a triangle motif with two more concentric triangles. Inside the last of these is an inner circle of light. As with the entire cover, there are seemingly random golden birds: three in this case within the triangle motif. The centre panel (the panel what eventually becomes the centrepiece of the entire cover once opened in all its glory) shows a golden buddha. We can also see the back of the obi here. This shows all releases chronologically prior to this release including Buddy Miles and Mahavishnu John Mclaughlin - in other words the complete Carlos Santana discography (band and collaborations) when Lotus was released. 3. Opening left again we find the track list for the second record / disc along with credits. This is presented on top of a photo of the Egyptian "The Great Pyramid of Cheops" (Khufu) pyramid. Sri Krishna is seen on the other panel (to the right of the pyramid and the left of Buddha) with a peacock feather in his hair. There is a hand (Krishna's pressumably) emerging from the bottom of the image holding a lotus flower in full bloom (and of course a golden bird). 4. Lifting up the furthest left hand flap (the one with the pyramid on it) reveals Jesus on the cross on the top panel surrounded by angels. There is also an oldish looking gent (perhaps a saint) looking down from behind Jesus and two hands coming in from the top of the image. The top of the image is bordered with a repeating motif of a palm treed island and setting or rising sub. The inscription "Registered No.3097" can be seen under one of the suns. The next panel down details the track listing and credits for the third and final record / disc. This is on a bright red background. In the central part of this panel has a schematic of the interior tunnels and chambers of the Cheops pyramid. There is a flying saucer in the middle of the pyramid just below ground level. 8. Now we completely close and repack the left hand side. Having done this we are back with the simple open gatefold showing the audience. Alternatively, the whole section to the left of the tail of the plane can be pulled out and left to one side until the entire right hand side has been folded out. The full cover opened up. Also shown here are the 3 CDs, 4 card inserts showing members of the band (across the top of the image), and the 3 CD inner sleeves. A poster of images from this album cover was made by CBS Sony Inc at the time. It appears in the book "100 Posters of Tadanori Yokoo" selected and with comments by Koichi Tanikawa. In 1974 Yokoo undertook to handle the design of a record album showing the twenty-two faces of rock star Carlos Santana, and for his work he received the Special Award at the 6th Graphic Art Biennale in Brno. This poster comprises the same images used in the album arranged on a single plane; a variety of sacred images both ancient and modern, oriental and occidental. With its images of Annunciation, the Virgin Mary, Mother and Child, Christ, angels, Krishna, Mahavairocana-tathagata, lotus blossoms, pyramids, the Sacred Triangle, UFOs and Himalayas, this poster could, without doubt, be described as a modern-day mandala, or graphic aid to meditation. Through the course of this work, Yokoo became extremely close friends with Santana. 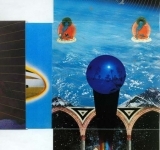 Santana revered the guru Sri Chinmoy and always recognised him as being one with God; therefore when he saw Yokoo's design it is probable that he immediately felt an empathy for the designer's mysticism, while Yokoo speaks of his first meeting with Santana as karma, or fate. Santana describes his feelings about this same meeting by saying: "I experienced most forcefully the impression that I had met Tadanori in a previous existence, and, moreover, I remembered that I myself had been Japanese in a previous existence." 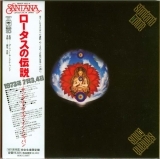 In speaking of Yokoo, Santana ordinarily refers to him "my spiritual disciple". The trademarks CBS and CBS International are used for the overseas equivalents of Columbia Records. In Japan, such albums are produced for Columbia by Sony. The poster measures 72.8cm by 103.0cm and appears in the book in black and white. It is not clear if it was originally in colour. "The Ravine" Illustration Original Conception by The MGM Motion Picture "2001 A Space Odyssey", through the courtesy of Metro-Goldwyn-Mayer Company Ltd.
2010-10-22 - Reprint (2010-09-22) recorded by robot harry (source CDJapan).